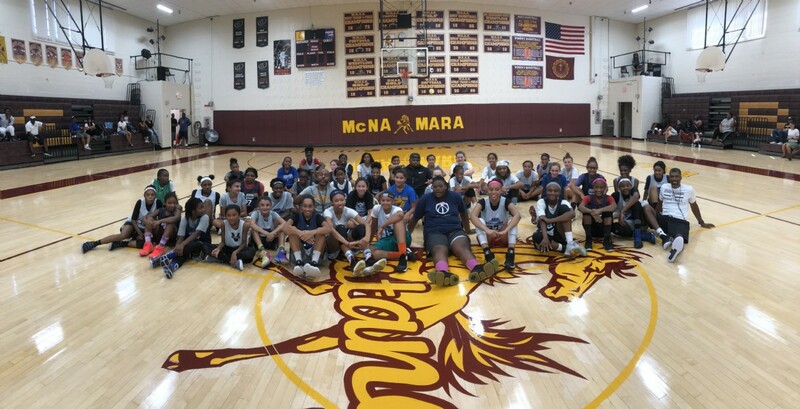 On Labor Day, the traditional "no work" day set aside for rest and cookouts, close to 50 girls put in early morning work to become better ball players. The four hour session spent half of the time with skill work and basic defensive concepts that each player will need as they progress to the next level. There was also an NCAA Parent Information Session led by Scott Buckley, assistant athletic director and NCAA School Coordinator at Roland Park High School. Parents and kids both learned a lot over the first half of the combine and once the competitive period started it became clear who all were paying attention to detail. The combine covered classes 2022-2027, this segment will focus onf the 2024 through 2027 clases. To read about the older players check out our Part 1 Recap. Savannah had good size for a 7th grader. She got stronger as the day went on and was able to use her size to her advantage. Ava showed a strong handle in the drill work and had a good mid-range shot. She was capable of knocking down shots out to the three point line. What Amber lacked in size at 5'0" she made up for being one of the quickest players in the building. She was able to attack and get to the basket well and is a good finisher. Brooklyn is very good at attacking the basket. She can get by and finish against much taller defenders. McKenzie has the frame of a high school player already. She attacks with confidence. Her path to the basket is a little wide but, she is able to use her size and strength to get to the rim anyway. Jayla is the product of a basketball family and has good size to develop as a post or peremeter player. She got the toughness award after bouncing back and fully participating after being carried off the court with an injury in an earlier scrimmage. Hope seems to have perfected the skill of catching and finishing without putting the ball on the floor. Even after rebounding Hope kept the ball high putting it back in the basket. Her abilty to fight the urge that many kids have to needlessly put the ball on the floor makes her shots faster and harder for defenders to time. She has nice hands nd is good at catching bad passes. Jaylah did a good job getting to the basket as she never really got stopped. As she grows and finishes better, I can see her becoming a great scorer. Simone was one of the best at keeping her dribble under pressure. She keeps her head up and was able to repeatedly spot open teammates. She drives well and has a good enough shot to keep defenders off balance. She can finish but can work on her consistency after contact. Overall she was one of the better players in the building. Zoe has good size for her age and is a pretty good shot blocker with good timing on her jump. She showed the ability to start the break pushing the ball in transition past half court before needing to pass. Malia, as with most of the elementary school players is small right now and will grow. Her skill level is solid and she was very quick and shifty with the ball. The #1 player in the class of 2027 seemed like a punch line a few years ago, now it's a reality even if it's by default. Obviously Alyna has a lot of growing to do but, she is off to a good start. She worked every drill and played along side high school freshmen and never appeared nervous or afraid. Stay tuned for updated post combine rankings.